The Fujifilm GFX 50R camera is a rangefinder style camera featuring high image quality which is ideal for street photography. Fujifilm announced this new medium format camera on the run up to Photokina 2018. This mirrorless camera which has medium format sensors features dual card slots - both slots support high-speed UHS-II cards. They can be assigned to store files according to their format, e.g. JPEG, RAW or Movie. Supplied with a 3.69M-dot electronic viewfinder evf with 100% coverage. It uses dedicated rich lens elements to achieve extremely high definition finder live view and offers a diopter adjustment range of -4m-1 to＋2m-1. The newly-developed focal-plane shutter is the world's first specifically designed for medium format mirrorless cameras. It is a low-noise mechanical shutter that withstands 150,000 actuations and offers shutter speeds up to 1/4000 sec. 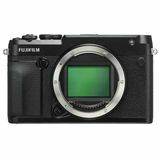 The Fujifilm GFX 50R rangefinder style body is complete with a weather sealed design.